I have learned to love thread! Hooray! I have been busily making bookmarks the past few days for gifts for my daughters' teachers. I really enjoy working with thread; it always looks fancy (even when it's really, really easy). I'd love to start on a summer cardigan in thread-- but considering my "crochet ADD" it might take a decade for me to finish! 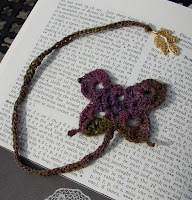 The pattern I used is Apak's Butterfly Bookmark. I used the chart, but kept going in the round to make the 5 petal flower. I added an extra (3 dc, ch 3) in the first round to make the 6 petal flower. A row of foundation single crochet makes the thong part and the leaves are freeform. The butterfly is done in Noro Sekku and a 1.5 mm hook, it has a charming, rustic quality about it. 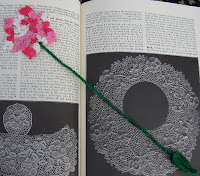 How lovely - I've seen that butterfly bookmark pattern before, but I really prefer the flower you made...I think I could do that because my eyes don't like thin thread, but this one won't take too long...I just love these! Turtle Tape Measure Cover-- The pattern!